When looking to purchase locks for your home or business, the number of options available on the market can be overwhelming. There are many different types of locks – they come in different shapes, sizes, and designs and offer different levels of security. In this guide, we look at the different types of door locks so you can make an informed decision when purchasing one. Knob locks are the most common type of door locks. They are installed on exterior doors in residential properties. These types of locks are affordable, secure and easy to install. Additionally, they come in many styles and finishes to coordinate with other door accessories. Worth mentioning is that they are not as secure as you’d expect since the lock cylinder is in the knob and not the door. Consequently, they can be bypassed using a wrench or pliers behind the knob or broken off the door with a hammer. To make them more secure, you can install them alongside deadbolts. Deadbolts provide the best protection against burglaries and break-ins. They employ a deadlatch which is designed to prevent battering, boring and “jimmying” – pushing the latch back with a knife or ice pick. This door lock is used with key-operated doorknobs and levers – the key rotates the lock cylinder to the open position. A drawback to deadbolts is that they are prone to malfunctions. The doorknob/lever may refuse to turn when the locks are unlocked, locking you in or out of the house. This can happen to any brand of lock and is caused by a deadlatch failure. If you find yourself in such a situation, call a reputable locksmith like CPPM to address the problem and perform lock repairs. Mortise locks are usually found in commercial and upmarket residential buildings like condos. Additionally, they are preferred by most commercial property and home insurance providers. These locks require a mortice to be cut into the door where the lock is fitted. The mortice cylinders feature threads on the outside and are designed to be screwed into a mortise lock. Lever handle locks are commonly used for inner doors in commercial settings. They feature a deadbolt and thumb turn and come in two options – full-plate and two-piece. They are secure and simple to install and perform lock repairs when they break. As the name suggests, electric door locks are operated by means of electric current. They are sometimes stand-alone or connected to an access control system. 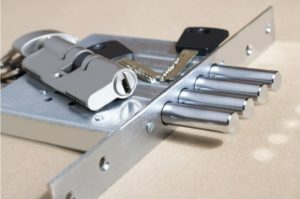 Advantages of these locks include greater control over access and access can granted without keys. We hope that this guide will help you find a lock that’s right for your commercial or residential property. Just be sure to measure your door’s back set, thickness and cross bore to find the right fit.